ANOTHER case of needles in strawberries has come to light after a woman bought punnets from Wingham Coles in New South Wales. The woman who found the needles took to Facebook to alert others and urge people to check their strawberries or throw them out. Chantal Faugeras said three needles were found in three strawberries when her 10-year-old child tried to eat them. "We brought 2 punnets from Wingham Coles. Kids chuck them in so not sure what both brands were..only complaint was tonight from 'Delightful' strawberries," she said. "This one, we found 3 pins inside 3 strawberries. Responding to commenters about whether it was Coles or Woolies, she said: "Shocked to say the least because though it was woolies brand from other states but I literally squashed 2 out and my daughter found the first eating one. Well it may have not been the first??" "They are pin heads like a tailor make would use and don't go all the way through. They went through the green top and half way thru strawberry so if you ate whole would not know," she said. One woman wrote on the post: "Sent my 7 year old to school with this brand strawberries this morning. Just phoned the school after a friend had warned me & the office ladies are straight onto it thank god." This latest allegation comes after health authorities issues warnings for people who bought strawberries in Queensland, NSW and Victoria to throw suspect punnets out after several incidents of needles being found. Police suspect a disgruntled former employee sabotaged the strawberries with the sewing needles. Strawberries from Berry Obsession and Berry Licious have been contaminated with sewing needles. Source: Queensland Strawberry Growers Association Facebook. 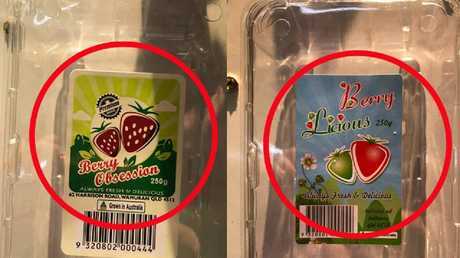 "We're fairly confident if people do come forward with a needle in a strawberry, particularly with the packaging, that will provide us with some information," he said. Stores were throwing out strawberries currently in stock but fresh produce was expected to be available from yesterday.